Purchased by E. Makowen at the 1928 exhibition, and by descent to the present owner. London, Leicester Galleries, Exhibition of Works by C.R.W. Nevinson, October 1928, no. 33. The 1920s was a productive period for Nevinson, during which the subject of the urban landscape reoccurred regularly in his paintings. In addition to London and New York, he also travelled to and painted various locations in France, including Paris, Montparnasse, Dieppe and Boulogne. After leaving the Slade School, Nevinson studied at the Académie Julian in Paris, and after that returned many times to France. In 1912-13, Nevinson met the Italian Futurists and formed a strong friendship with Severini. Their fascination with the speed and noise of the modern city appealed to Nevinson, and there are still elements of this in his works of the 1920s. In A Boulogne Window, Nevinson captures the steam of the passing ship and the hurrying figures on the street with great dynamism and energy. There is also evidence of his interest in Cubism in the present work. His use of words such as 'HOTEL' and 'BAR' on the building on the left of the picture recall works by Picasso and Braque. This technique can also be found in other works by Nevinson himself, such as in Sur la Terrasse, Montparnasse, 1925 (sold in these rooms 10 June 2005, lot 38 for £96,000) and Le Vieux Port, circa 1913 (Government Art Collection, London). Nevinson resists writing the word 'HOTEL' in a logical and realistic way here. Instead he leaves it hovering in space, and so defies the perspective of the building. The viewpoint through which Nevinson has presented the city landscape in A Boulogne Window suggests a certain distancing from the subject matter as the scene is viewed from above out of a window. 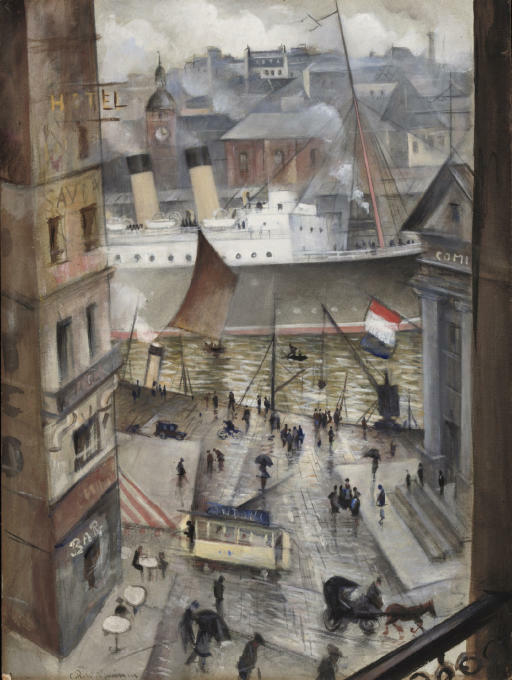 Nevinson employs a similar composition in Amongst the Nerves of the World, circa 1928-30 (Museum of London), in which the modern city is glimpsed through a gap in the buildings.